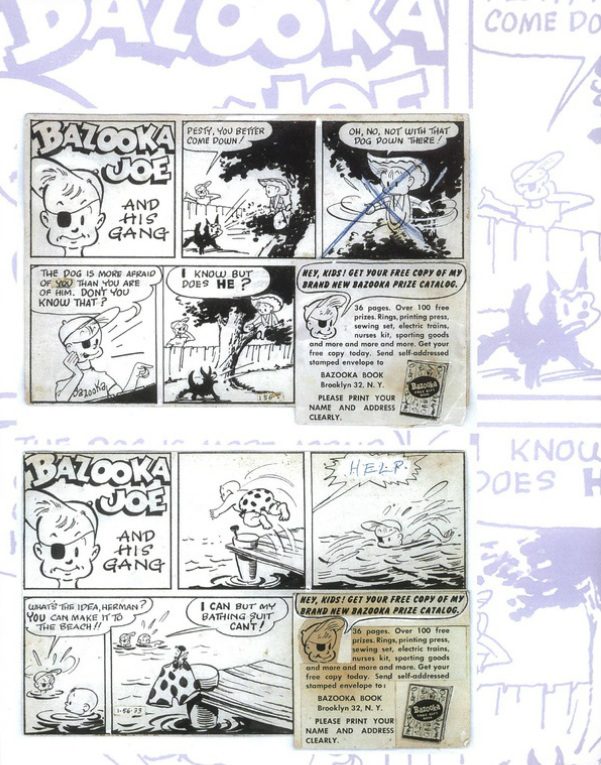 From 1954 on Topps released several series of Bazooka Joe episodes each year. It is generally known that Morse was chosen to draw the strip by Woody Gelman, Creative Director for Topps. Gelman knew of his legendary work on the Tijuana Bibles and had seen his comic strip work of the 20s and 30s and pin-up art of the 40s. Bazooka Joe, Pesty, Mort, Herman and The Gang have crossed many generations. Kids around the world have met them and enjoyed their silly antics while blowing big pink bubbles. Although their characterizations have changed over the years, the most memorable and sought-after Gang was the one created by Morse. It is his name, and his name alone, that is synonymous with Bazooka Joe.